Every year, the world's best speedrunners gather to play games in ways you've never seen before. It's not just a great time—it's also for a great cause. To the uninitiated, the Games Done Quick charity events have all the makings of a cult—or at least something that would make your grandma sadly shake her head. Tens of thousands of dollars raised in an epic struggle between the "save the animals" and "kill the animals" camps. Frustrated, futile shouting towards a belligerent—or at the very least ambivalent—"RNG god." Hundreds of thousands of viewers absolutely captivated by an act that, at first glance, shouldn't be very captivating: watching other people play video games for 168 consecutive hours. Of course, it's not that simple. The Games Done Quick events—held twice annually in both Awesome Games Done Quick and Summer Games Done Quick forms—assemble the most skilled gamers in a single place for the sole purpose of showing off their amazing talents to the viewing public. Some know the fastest routes beginning to end. Others can exploit programming flaws, turning well-known games into obscene parodies of their former selves. The more adventurous runners take it to the next level, adding handicaps like blindfolds and one-armed play into the mix. The Super Monkey Ball series is one built on absolute meticulousness and inching your way across unsteady territory to a seemingly impossible goal. So it's highly entertaining to watch Geoff rocket his way from Point A to Point B with a reckless regard for gravity. But Games Done Quick is more than just a stunt show. Every year, the two events raise an impressive amount of donations for Doctors Without Borders and the Prevent Cancer Foundation, with the most recent Summer Games Done Quick bringing in a cool 1.2 million dollars. These aren't simple PBS or NPR-style pledges, though. While people can donate money with no strings attached, Games Done Quick offers a countless string of mini-goals throughout the event, and when they're met, the speedruns on display change in a variety of crowd-pleasing ways. Without a doubt, the previously mentioned "save/kill the animals" struggle generates the most money, with both sides locked in an ongoing fight over whether or not to keep Super Metroid's cast of cuddly critters alive at the end of the game—a completely optional act. In a world where games and the people who play them receive their share of negative publicity—sometimes deservedly so—Games Done Quick has done much to restore the medium's reputation. Regardless of your definition of "gamer," these events show we can be more than the stereotypical unhygienic basement-dwellers, low on life experience and emotional intelligence. If anything, these are marathons of human kindness, from the camaraderie on display between runners to the moments of sober silence that follow the many, many phenomenally sad stories of loss read during the Awesome Games Done Quick event. It's a brand of altruism you don't see very often, let alone from a group often regarded as overgrown adolescents who've yet to put away their toys. Anyone who wants to understand the entertainment value of speedruns should definitely start with Super Mario 64. Because this classic is built on some pretty creaky 3D tech, the amount of ways it can be broken is downright astounding. Finishing Ocarina of Time while blindfolded is hard enough, but adding a bunch of glitch-exploiting tricks on top of that? Runnerguy2489 makes it look (mostly) easy. Given Summer Games Done Quick's focus on charity, it only makes sense that this year's event took place in St. Paul, Minnesota, a city built on Midwestern values. Coming from my current, overcrowded digs in the Bay Area, I couldn't help but notice the incredible sleepiness of my new surroundings; I could walk for blocks without seeing another soul, and when I headed home through the silent streets at night, I couldn't help but feel like the last man on earth. With most of its comings and goings centralized within a hotel ballroom the size of a football field, Summer Games Done Quick is anything but sleepy. With seven straight days of activity and very little downtime, there's always something happening, buzzing, moving. Only a few years ago, most the attendees could be framed in the same shot with the current runner focusing intently on his or her game of choice—it now seems quaint that, at one point, viewers could actually see the back wall of the room that held the event. These days, it's a much more elaborate affair: A raised platform at the far end of the room holds the standard Games Done Quick couch—occupied by the runner and often a few commentators—along with the most vital staff members: techies, donation wranglers, and the announcer. Two giant projector screens sit on both sides of this hive of activity, showing attendees the same video feed broadcast to Twitch. Yes, attending this event in person essentially means you're watching the same thing you'd be watching from the comfort of your home home, but the vibe of the audience undoubtedly transforms the experience. It's generally a well-behaved crowd, reverent and silent for the sake of the speedrunner on stage, but one that's not afraid to explode into cheers and applause after a particularly amazing performance. The good-natured vibe at Summer Games Done Quick is one that reminds me of the undersized anime conventions I attended more than a decade ago—right down to the faint funk of young people who haven't quite learned to take care of themselves at an event that doesn't give them many reasons to. No matter where I sat, someone nearby would strike up a friendly conversation, mostly about their favorite runs and runners; in this world, being good at video games can give you minor celebrity status. After each runner left the stage, it wasn't uncommon to see them swarmed by a dozen fans. Well, maybe "swarmed" is the wrong term—let's go with "politely approached." This is a respectable crowd, after all. Since the entirety of my two days at Summer Games Done Quick were simply spent sitting and watching, there's not much of a narrative to pull from my personal experience. Instead of occupying the time of staffers—who rightfully had better things to do—and runners—busy practicing and overcoming anxiety—I decided to attend Summer Games Done Quick as a silent observer, watching, taking notes, and getting a general feel for the show that would help inform my post-mortem interviews with the extremely talented runners and staffers who agreed to participate. Hopefully, their insight will show you Summer Games Done Quick is about much more than video games. As someone who only watches these marathon events without participating in the community, I needed to find some contacts who lived and breathed speedruns. And, thanks to the assistance of the Games Done Quick organization, I managed to find several willing subjects. Here's who you'll be hearing from throughout the course of this cover story. Chris Grant acts as Summer Games Done Quick's press liaison, and gave me a brief tour of the event's inner working in the little time he had available. He also runs games like Oddworld: Stranger's Wrath, Half-Life 2, and several indie games. His runner handle is "Studio." Davis Thorne, known by the handle "DarkTerrex," has been part of the speedrunning community since July of 2013, and runs Mega Man 6 and Wizards and Warriors. 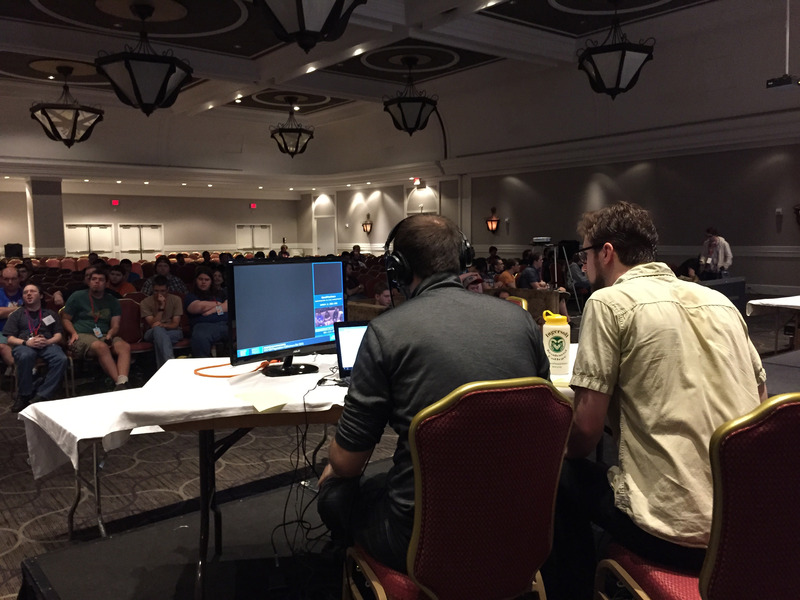 Aharon Turpie, known by the handle "Testrunner," is the tech coordinator of Games Done Quick, making sure everything runs smoothly behind the scenes. He's perhaps best known for his speedruns of The Legend of Zelda: Skyward Sword. 2dos, who wishes not to use his real name, has been speedrunning since 2013, and specializes in games like Donkey Kong 64 and Crazy Taxi. With this group, I managed to find a good mix of staffers and runners who have a broad range of experience and years devoted to the speedrunning community. That said, let's let them speak for themselves. Davis Thorne: I’ve grown up with games all my life. I actually owe a bit of my eyesight to gaming. I had terrible eyesight as a child, and the only way that my parents could get me to wear this eyepatch required to make one of my eyes stronger was to play games. And so, I kind of became a gamer just based off of that. [Encouraging me to play video games] was a bargaining chip for sure. I hated wearing the eyepatch, it itched, covered one eye, couldn’t see very well—had to cover my good eye, of course. [It] forced my other eye to work, and my eyesight’s a lot better as a result. 2dos: Well, the first video game I remember playing was Super Mario Bros., and I’m sure that was a lot of people’s first game. But, my first actual system that I owned was actually Sega Genesis, and that was only a year or two after the N64 came out, and I’m a Donkey Kong 64 speedrunner, so a lot of my nostalgia for video games comes from that system in particular... I think I was around nine or ten years old when it first came out, and that’s where my most fond memories of a home console system comes from, I guess. Thorne: [Speedrunning] was something that I just found on my own, to be honest. Technically, the first game that I ever ran was Ico, the PS3 remake, because there was a trophy on there to beat it in under two hours. So I looked up videos on how to do that, I got the trophy, I was really happy about that. Then, a year and a half after that, I was playing Mega Man 6. It was my favorite game growing up as a kid; I would always play Mega Man 6 when I was little. So, I kind of roughly timed it just for fun, I was like, "Wait, I wonder if this is actually a legitimate thing?" And just started digging in to see if it was an actual hobby people did. 2dos: [The speedrunner iateyourpie has] been my friend for a long time. I think I’ve known him since I was twelve or so, and that was over a decade ago. We would actually do races, way before we knew the speedrunning community was a thing. And eventually, iateyourpie found his way into the speedrunning community of today... [H]e brought me into it a year later, after he got into it, as well. That was in 2012 for him, and I got into speedrunning in 2013—in the actual community. We would start out with games that we knew, like, Ocarina of Time. "Let’s play as fast as we can." We didn’t know any glitches, so it was just a playthrough as fast as we [could]. And then it eventually branched off to "Let’s do a game we’ve never played before." I can’t really remember anything in particular right now, but we would eventually branch off into games we’d never played before, and it would become races of those games. It’d be actually pretty fun. One of the hidden joys of Games Done Quick can be found in the way it allows you to vicariously get revenge on games that tortured you throughout your youth—and for many, that game is Battletoads. Watch these two trounce an extremely difficult experience where adding an extra player only makes things harder. 2dos: Well, DK64 wasn’t my first speed game, but I saw the runner cfox doing a run one day. I saw [Donkey Kong] flying through the air, and I’m like, "Holy crap, that’s a really cool trick. I guess I’m going to learn this game." So I used to play this game a lot, and it’s pretty much self-explanatory from there. I just got into the game, and I know it really well now. Grant: [The reason I chose my speedrunning games is] because I like them. I think that’s the biggest thing. You have to either like it as a normal game, or if you think it looks really cool as a speedrun. Like, there’s tricks to it that are interesting, you have to like that a lot. Half-Life 2, as a casual game, I actually thought wasn’t that great. It was cool, but the water section went on too long with the boat. Actually, every vehicle section went on too long. And it was a cool game, but it wasn’t that great. I actually like Half-Life 1 a lot more. But why I like Half-Life 2 to speedrun is you essentially fly with how fast you’re going. You are just zipping around the entire map bunny-hopping—well, the equivalent of bunny hopping. It’s very cool and very fun. Turpie: Before I started Skyward Sword, I used to speedrun Super Metroid, and I kind of wanted to do something else. I tried out a bunch of different games. I remember, I think I tried A Link to the Past, and I remember I tried The Minish Cap and things like that. But I had just finished Skyward Sword at the time it came out, so this was November 2011, and I just really liked the game at the time. And I just thought, I’m going to change games, I’m going to start speedrunning something else, and I really like [Skyward], so, I’m going to start running this and see where it goes. And at the time, it was new, so there weren’t any tricks yet. One of the really nice things about speedrunning a new game is you get the route out, you get to search for tricks and so forth, and there’s a huge joy to that—to discover things for yourself. A lot of times you’ve got a very well optimized, clean, and very popular game, you don’t really get that opportunity to route out a speedrun, so, that’s another motivation for me going to Skyward Sword. [I]t was not very popular at the time, so it let me discover [things] on my own. Thorne: [Mega Man 6] was the only Mega Man I had growing up. I didn’t play the others until the Anniversary Collection came out. So, that naturally is my favorite one, and I love everything about it, again, because of how much I played it as a kid. I knew that game forwards and backwards already. Pretty much all the games that I’ve picked so far—Star Tropics 1 and 2, Mega Man 6—those are all games that I grew up with. [With] Wizards and Warriors, I just looked at it, and I thought, "Oh, I think I can learn this fairly easily." So, I bought a cart, because my brother claimed the cart that we had, and I just started going at it. I found it really pretty simple to learn that game. It’s mostly just because I grew up playing that game. That’s why I decided to run it.